I wanted to write down my birth story, so I could look back on it as I'm likely to forget some of it. So with that in mind, I will start from the beginning. My due date was 30th May 2013. Although I ended up going two weeks overdue, and was induced at 13 days over. 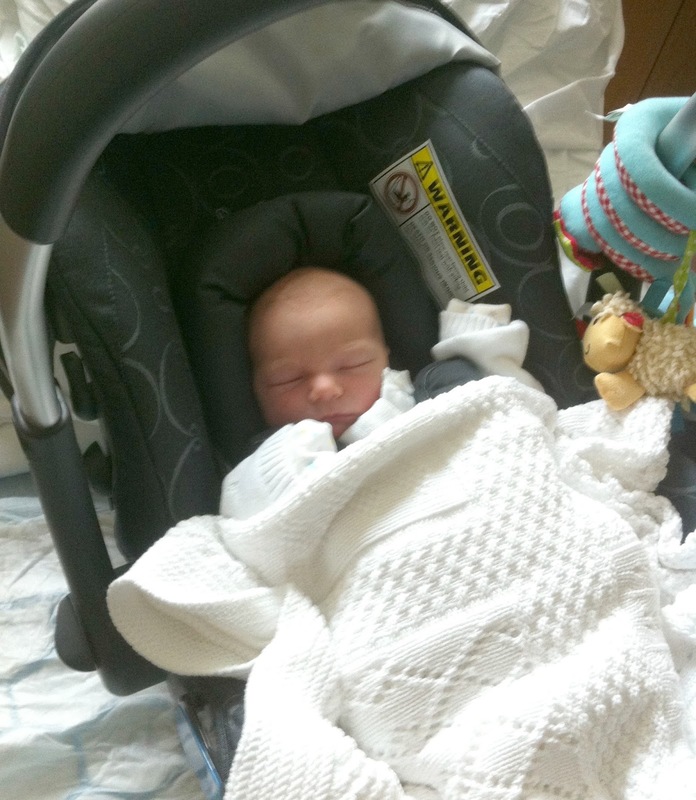 I had previously had two sweeps which were done at my midwife appointments; at 40 weeks and 41 weeks, but nothing happened so we were booked in for induction. 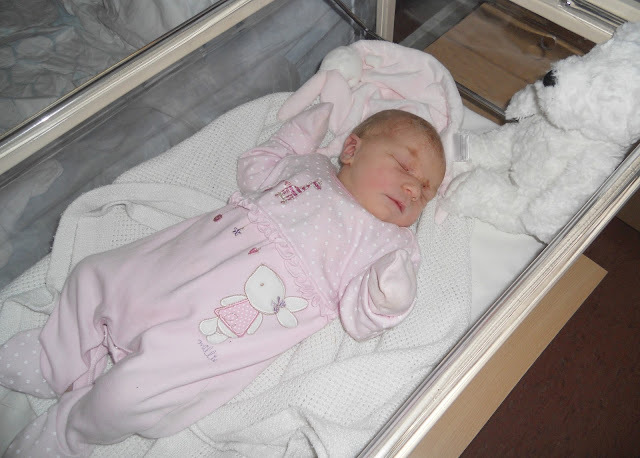 We arrived at the hospital at around 10am on Wednesday 12th June. They hooked me up to a machine to monitor baby. We were waiting around for quite a while, but at 12pm the midwife inserted my pessary. She said it could take up to 24 hours to work so it was just a waiting game from that point. Luckily, I had packed loads of magazines, my iPod and some puzzles so Toby and I just sat there doing word searches haha. My mum stayed for a while but there wasn't much happening, so she went home after an hour or so. We just chilled out for most of the afternoon and tried to keep ourselves busy. Fast forward to around 7pm, I was getting mild cramps but nothing major. Toby went home at this point as he had been there with me all day and there wasn't really any progress. I told him to go and get some rest as tomorrow would be a long day – or so we thought. The midwife had said earlier that day they would break my waters in the morning as my pessary would have been in for almost 24 hours by then. Before Toby went home, he sorted the hospital TV out for me, so I could catch up with Emmerdale and Coronation Street. At 11pm, I text my mum just to update her and to say goodnight. I tried to get to sleep but the cramps were getting stronger which kept me awake. At 12am, I nipped to the toilet and the pessary came out. I told the midwife and the doctor came shortly after to check. She examined me and I was 2cm dilated at this point. She then inserted some gel and things progressed pretty quickly after that. I couldn't get comfortable at all and I was in a lot of pain through the night. My waters broke at 2.30am when I was on the toilet, I told the midwife but she didn't seem to believe me. She was supposed to come back and check on me but she then went on a break. I pressed my buzzer for the midwife as the pain was quite strong and I wanted some pain relief; she gave me some codeine but it didn't help – I was then sick and I felt horrendous! The pain was getting so strong and I just didn't know what to do with myself. Around 4am, I pressed the buzzer (again) and a different midwife suggested an aromatherapy bath. I couldn't think of anything else to do, so that’s what I did. She offered me more codeine but I declined as I felt very nauseous. I only got out the bath at about 5.30am but the pain was getting unbearable and I just had to breathe through it but I was really struggling. I was very distressed so once I got out the bath and back to my bed, again I pressed the buzzer (I hated doing it; I felt like I was annoying them but I couldn't do very much!). After seeing how distressed I was, the midwife reluctantly decided to examine me and it turns out I was 8cm dilated. I immediately rang Toby and told him to come to the hospital and they took me straight up to the delivery suite. I remember asking for gas and air in the lift haha! That stuff was amazing! It was probably too late for an epidural but I didn't really want one anyway - I was terrified at how big the needles were when I had watched One Born Every Minute earlier on in my pregnancy. I didn't write a birth plan either - mainly because I didn't want to be disappointed if I didn't get a certain birth. Although, a water birth would've been my preference - I wasn't allowed one as I had to be induced. To be honest, it all happened quite quickly. Toby arrived at the hospital at 6am, just in time, as Sophie was born half an hour later at 6.32am. I can't seem to remember how long I was pushing for, but it can't have been for very long! When she was born, the midwife said she was "quite big" and "at least 8lb", so we were quite surprised when they weighed her and she was 7lb 13ozs. She seemed so tiny! Throughout my pregnancy, she was measuring a bit bigger, about 8lb 7oz. I was so worried she was going to be a huge baby, especially as I went two weeks overdue, so I hardly bought any newborn clothes! I was stitched back up by the doctor as I had a second degree tear (ouch!) which took about an hour. I kept shouting at her because I could feel her tugging, I don't think there was enough anaesthetic. I had a quick wash, we got Sophie dressed and then we went back down to the ward where they pretty much left us to it. We stayed that night then went home the following evening (Friday 14th June). I seriously couldn't wait to get home! 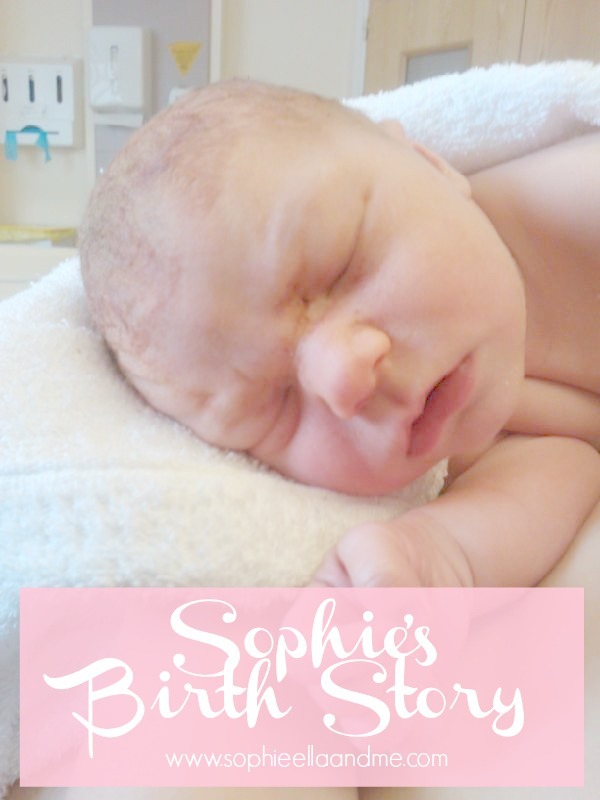 They weren't sure whether we would have to stay another night to monitor Sophie’s feeding. We had tried breastfeeding at first but she wouldn't latch properly. I was exhausted and found it way too stressful, so during the night I decided to give her a bottle of formula. She thankfully took to it really well so we got to go home that evening. I really didn't want to stay as the midwives were so busy with everything else, they pretty much left us to it. 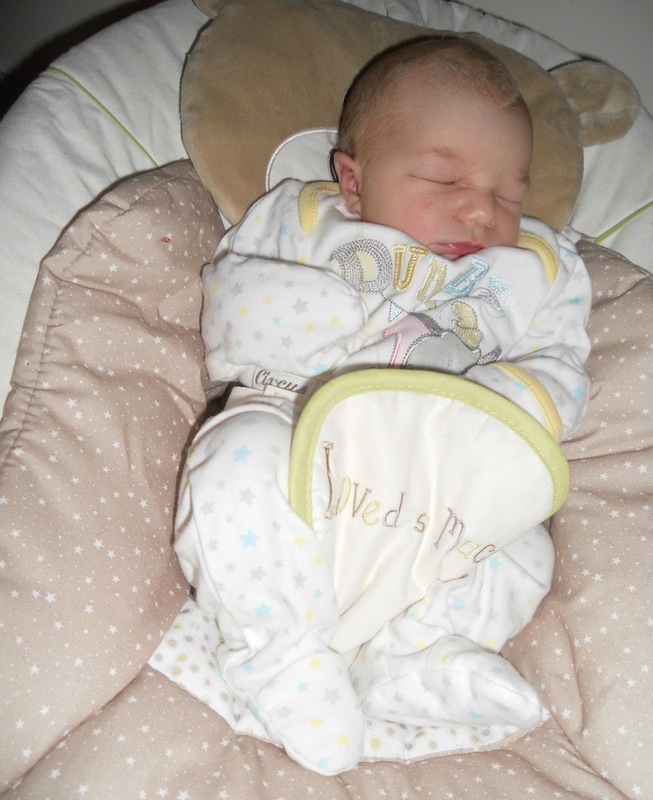 We had never changed a nappy, fed or winded a baby before, so as first time parents we had no idea what to do and received practically no help from them. We settled in well at home, Toby was amazing and sorted Sophie through the night while I caught up on sleep as I hadn't slept in about three days! I'm so thankful that she arrived safely and there were no complications. 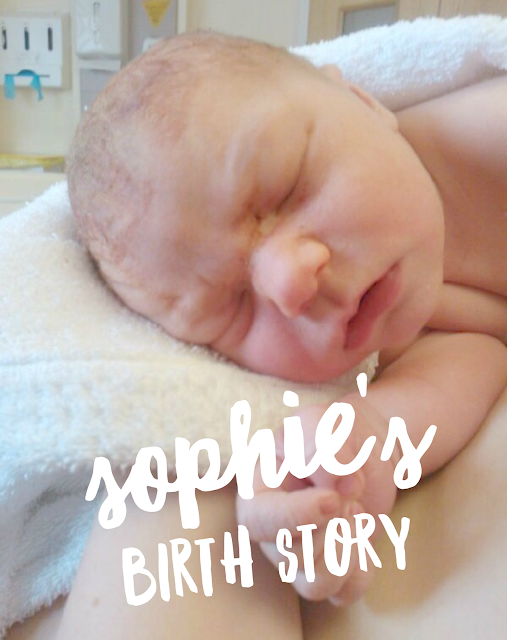 I hope you enjoyed reading how Sophie came into the world! I'd love to hear your birth stories too! Ah I love this, love reading birth stories now as I've only shared my own. Your partner made it just in the nick of time didn't he!! Your midwife didn't sound too supportive which is a shame, But sounds like you had a good labour, I only had gas and air when I had my eldest and it made me feel as if I was very drunk! Ouch to the second degree tear, a friend of mine had a third degree tear and I remember the agony she was in for a long time afterwards. It's amazing isn't it, as not one labour and birth is the same! Yeah, it was pretty straight forward and thankfully there were no complications!